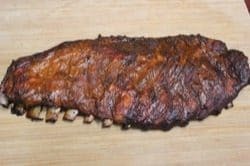 I am so excited to share this 3-2-1 smoked spare rib recipe! 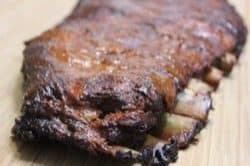 If you haven't used the 3-2-1 method to get smoked spare ribs to that coveted “fall off the bone” tenderness, juiciness in every bite and a crust on the outside that will tantalize your tastebuds, then you haven't had ribs at their best. With easy to follow instructions and my original rub recipe (purchase recipes here) in hand, it's a win-win situation! Barbecue's Greatest Secret.. My Original Rub Recipe! 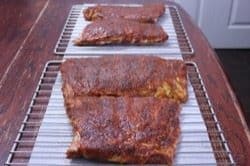 Be sure to use my original rub recipe on these super bowl smoked spare ribs. They are easy to make using common ingredients that you probably already have in your pantry or spice cabinet and you'll be amazed at how good they are. 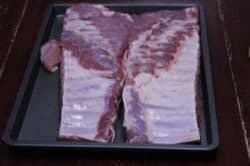 Place the spare ribs bone side up on a cutting board or down in a pan. 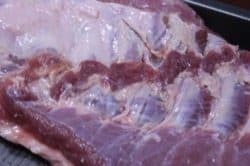 First we have to remove the flap of meat called the skirt.. this piece is best removed and cooked alone to allow a more even thickness of the ribs and to allow more smoke to get to the back side of the ribs. Using a sharp knife, hold it up vertically with one hand and slice it off as close to the bone as you can get. If you look closely, you will see a thick plastic-like membrane on the outside of the bones. Very carefully, get your fingers under this and with a good grip, pull it clean off. If you need a better grip, you can use a paper towel or some catfish skinning pliers. It's not important that you get it all off in one piece or even that you don't leave any. Get as much of it as you can. The one on the left still has the membrane, one on the right has been removed already. There is a odd shaped bone that runs sort of diagonal on one side of the rack of spare ribs. 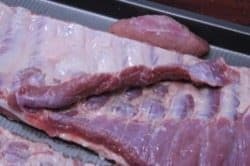 You don't have to remove it but it does make the ribs much easier to slice when they are done smoking. I call it bone, but really it's mostly cartilage so a good sharp knife and it will come off with relative ease. While the meat is still laying bone side up, it's a great time to go ahead and season up this side. To help the rub to stick really good, apply a good coat of yellow mustard all over. Generously apply my original rub (purchase recipes here) to the bone side of the ribs giving preference to the more meaty areas and less preference to the bones themselves. Leave them sitting there for about 10 minutes to let the rub draw moisture from the mustard and the ribs. You will see a visible change in the rub once they are ready to turn over. Flip the spare ribs over to meaty side up, bone side down. Apply a coat of yellow mustard to the top and sides of the ribs to make sure the rub will stick really well. Generously apply my original rub (purchase recipes here) to the meaty side of the spare ribs. Leave them sitting there for about 10 minutes to let the rub soak up the some of the moisture. The rub will get a sort of “wet” look to it when they are ready to go on the smoker. Note: if you have a really small smoker, it may be necessary or simply advantageous to cut the rib racks in half. This will help them to fit better and as an added benefit, will make them easier to handle. Set up your smoker for cooking at about 225-240°F using indirect heat. If your smoker has a water pan, fill it up. If it is cold out, consider allowing your smoker to preheat for an hour or more so the metal can warm up and help reduce the heat recovery time when you open the door to insert the food. 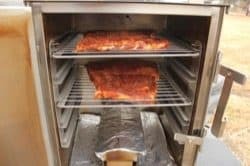 Once your smoker is ready, the spare ribs can be placed in the smoker. I used the Smokin-it 2D electric smoker but any smoker will do. I really love using my Camp Chef Woodwind SG pellet smoker for these as well. I recommend using cherry wood for smoke but pecan, hickory, apple, etc. will work fine. Use the smoking wood that you have available. 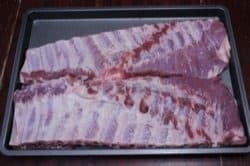 Place the spare ribs directly on the smoker grate or if you cut them in half, you can place the halves on Bradley racks, cooling racks or a Weber grill pan to help transport them to the smoker. Maintain 225-240°F with smoke during this first 3 hours and keep the door/lid closed for better heat retention. At the end of 3 hours, wrap the spare ribs in a double layer of heavy duty foil. It is best if they are not wrapped extremely tight but it is important that the foil is sealed pretty good so the steam can stay inside and help to tenderize the meat. Some folks add juice or some liquid to the foil before closing up the foil.. I have done this as well but in my most recent experience, I get better results from omitting the extra liquid. 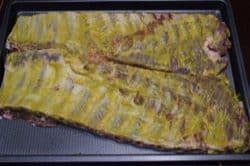 Once the ribs are wrapped in foil, place them back into the smoker and continue cooking them at 225-240°F for about 2 hours. At the end of 2 hours wrapped in foil, the ribs will be really tender but the outside will be soft and mushy. 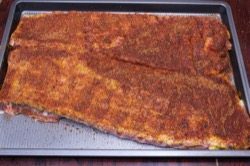 To form a good crust it is essential to give the ribs another hour or so in the smoker, unwrapped. Remove them from the foil and place them back on the smoker grate for 1 hour. You can also throw them onto a hot grill and get this done quicker. The grill is also a great place to add some sauce and let it caramelize. I made a delicious mustard sauce by mixing my original barbecue sauce (purchase recipes here) with equal parts yellow mustard. 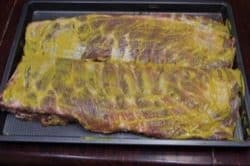 I fired up the XL Big Green Egg (325°F indirect) and gave the ribs about 5 minutes on each side while painting on the mustard sauce. I highly recommend this sauce and method. 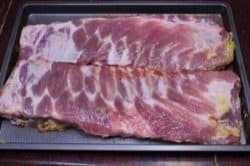 Once the ribs are finished, place them on the counter with some foil tented over the top for about 20 minutes to let the juices redistribute throughout the meat. Slice the ribs between the bones and serve right away. 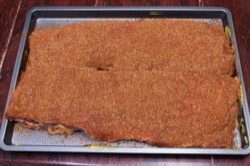 It is ok to season the ribs with my original rub (purchase recipes here) the night before and it may even make them better. 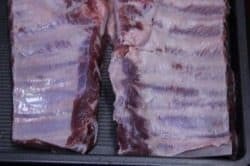 Be sure to season the skirt and brisket bone and cook them right along with the rest of the ribs, I usually do not wrap these but let them go for an hour or two and they make great snacks. 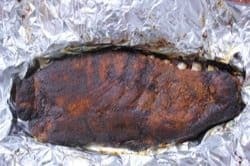 If you decide to do baby back ribs instead, the steps are 2-2-1 instead of 3-2-1.. just one less hour in the beginning. 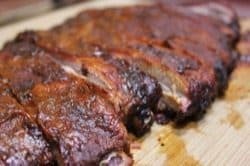 If you haven't used the 3-2-1 method to get smoked spare ribs to that coveted "fall off the bone" tenderness and juiciness then you haven't had ribs at their best. 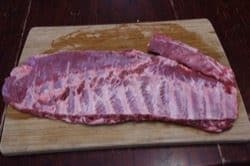 Place the ribs on a cutting board or into a pan bone side up. Remove the flap of meat called the "skirt" using a sharp knife. Remove the brisket bone at the top edge of the ribs. Remove the plastic-like membrane using a paper towel or catfish pliers for better grip. Generously apply Jeff's original rub to the bone side of the ribs. 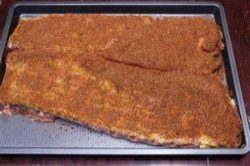 Leave the ribs sitting until the rub gets a "wet" look showing that it has absorbed moisture from the mustard and the meat juices. Flip the spare ribs over to meaty side up. Generously apply Jeff's original rub to the meaty side of the ribs. The ribs are now ready for the smoker. Set up your smoker for cooking at about 225-240 °F using indirect heat and cherry wood for smoke. 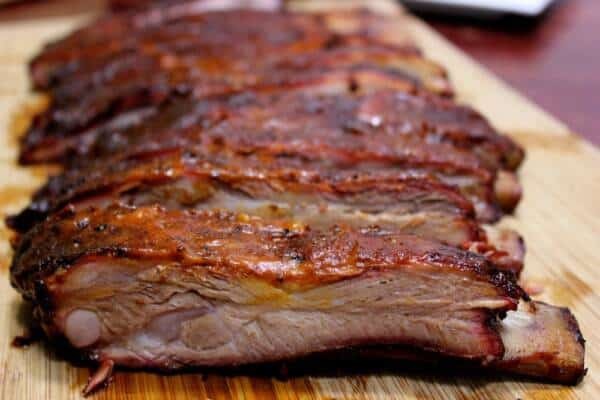 Once the smoker is ready, place the ribs directly on the smoker grate and cook for 3 hours. At the end of 3 hours, wrap the spare ribs with 2 layers of heavy duty foil to allow the ribs to steam and tenderize. At the end of 2 hours wrapped in foil, unwrap them once again and place them back into the smoker at 225-240°F to firm up the crust and finish cooking. You can also place them on a 300°F grill for about 5 minutes each side. This is a great time to brush on sauce if you like. Thank you for all of your info and tips etc. Have you ever tried using parchment paper rather than foil for this? My wife is allergic to aluminum so cannot do them with that but wondering if a double wrap with parchment would achieve the same results. Thanks again for all you do. Russ, I have not tried parchment paper but I am pretty sure it would work just fine for this purpose. Another option would be to place the ribs into a stainless steel pan and set another stainless steel pan upside down on top of it. The idea is to hold in the steam for a little while and let it tenderize the meat. I have used your rub on pork loin, ribs, pork shoulder and your barbecue sauce for pulled pork. I have enjoyed great comments and more importantly the pleasure my family and friends have from delicious meats. Your recipes and smoking instructions are by far the best. Been a follower of yours for about six months now and have tried a lot of your recipes and am a big fan. 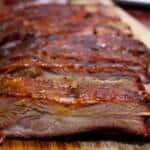 I have a couple of clarifying questions regarding this rib recipe. First, during the last hour, if I choose to put the racks back in the smoker, would you still recommend saucing them with your mustard sauce or does that only apply if you’re grilling them? Second and lastly, if I decide to apply the rub the night before do I do so as a sort of dry brine and then hit it with the mustard and more rub in the morning or are you suggesting that the night before I can use the mustard and the rub and be done with that part of prep? Thanks, Jeff! I’ve recommended your website and rub/sauce packages to every barbecue lover I know.. all about supporting the small business. Sam, first and foremost, thank you for supporting small business. It’s folks like yourself who keep the website, newsletter and forum going month after month and year after year. 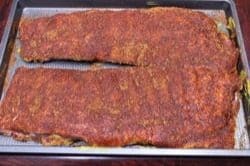 Regarding the ribs, if I decide to do them the night before, I usually hit them with mustard and plenty of rub and that’s all there is to it.. they go right on the smoker in the morning. You can always hit them with more rub if you think they need it. I sometimes sauce the ribs and sometimes I don’t.. just depends on what I am after but it really has nothing to do with whether I finish them on the grill or in the smoker. If I am doing the last step in the smoker, I will sauce them at the beginning of the hour then again every 20 minutes or so to get in about 2-3 good thin layers.